Thinking of doing a startup or going out on your own? Get inspired. I've tried and failed twice, but they were both terrific learning experiences. Update January 19th: the contest is now over! Check for the winners in the comments. Simple – at the bottom of this article, leave a comment about startups. Which recent startup (or founder of) impressed/depressed you? What's your favorite job-related startup? And/or- impress me with constructive feedback about JobMob and how I can make the site better for you. With revealing stories both funny and frank, Mikkel [Svane, founder, CEO and chairman of Zendesk Inc.] shares how he and his friends bravely left secure jobs to start something on their own, how he almost went broke several times, how they picked up themselves and their families to travel across the world to California and the unknown, and how the three friends were miraculously still together for Zendesk's IPO and (still growing) success. 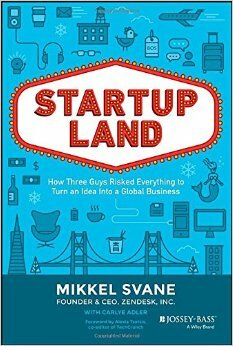 5 digital copies of the new Startupland: How Three Guys Risked Everything to Turn an Idea into a Global Business (which has a list price of US$18.19) are available to be won, wherever you are in the world. Simple – Leave impressive comments. The more impressive your comments are, the more chances you have to win. Plus, there are no limits on how many copies you can win, so if you want more than one copy, comment multiple times. As usual, you or anyone you know can try to influence the choice of winners by leaving more comments in support. To be considered as entries in the contest, all comments must be submitted by this Sunday January 18th 2015, midnight PST, which is 10am Monday morning Israel time (check your local time here). Subscribe to JobMob via RSS or email and follow me on Twitter for more inspiring quickie contests. Now this may not sound incredibly impressive, but with his guidance, our marketing efforts greatly improved. He had a media list that I used extensively, and between the two of us, we shared a lot of data and poured over statistics to make sense of where we should concentrate our efforts. He was most helpful in his ability to convince my other teammates to get onboard a certain marketing strategy if they were resistant to just my voice. After 5 years of managing to keep my startup running, I got a chance in a million to make millions…… 3 days before signing the contract, a software giant barged in and made the customer a ridiculous offer, causing him to cancel my offer…. This made me rethink my path. I got into the startup I’m working for after my first experience in financial world data-ware-house (it was an insurance company) where the dress-code was to wear suit every day. When I left, there was no other option than keep believing there is a startup of my dreams (and JobMob served like a lighthouse in the distance). So I went to see some coworking places here in Prague and in one of them they just played the first of Startup Land movies sequel. There was discussion after the movie and here am I, working for a startup. So my suggestion is to go out of your comfort zone, meet people, and keep good faith. Don’t get into the trap of believing that work is a drudgery everywhere. Candice, Gideon, Yonatan and Ján: thanks for jumping in here. Ján- your comments were automatically flagged as spam, my anti-spam filter was a little hyperactive. I saw your retweet which made me think that perhaps you commented too, and that’s how I found it. Actually, thanks to you, I also discovered Candice’s comment which had also been flagged unnecessarily as spam. A quote that I heard during my accelerator session made me think about it for a long time. Well, doing it just because you can isn’t the most appropriate advice I’d like to give anyone. Everyone is focused on great ideas but nobody cares about great execution. I am early in development of three projects. Each project’s main focus is to give the client/users actual worth. You’re not selling to a hoarder; you’re selling to the humblest person alive. My friend and I started a company together a few years ago. Almost immediately, we were approached about partnering with a successful multi-startup founder, who would bring money and other resources to the table. We spent a lot of time and focus gearing up to partner, but nothing ultimately came of it. The timing was wrong, the right people weren’t available, etc. All of that effort could have gone in to building our product instead. Now, we’re starting our third year together. It’s a slog, and we’re trying to bootstrap it ourselves. Since both of us have full time jobs and aren’t relying on the startup for daily expenses, it’s been difficult to push ourselves – we’ve learned the hard way that enthusiasm only lasts for so long, and you really need to grab it while you’ve got it. – Companies deliberately paid too much income tax because the excess money was eventually paid back linked to the rate of inflation. – Companies would buy from suppliers that were more expensive than others if the former allowed one longer to pay. One downside is that some companies who thought that their ventures were successful because they were receiving more money than they were spending, eventually realized that the money they received was worth less than the money they spent. Here’s why I think getting this book is important: Tai Lopez says that reading books are like having mentors. Reading biographies and startup stories are how you make friends with “the imminent dead.” There’s something really cool about that. People can mentor us from the grave, they can mentor us without even meeting us, and winning this book to me means getting an amazing free mentorship from Mikkel Svane. Im working on a audioconference startup in Mexico, and right now im working in my new startup based con sync live video and slides to create web presenetations. Thank you all for participating! Great comments. I’ll be in touch with each of you over email about getting your prizes.